The topics here are too complex to review in detail outside of a book, but in one blog post I'll try connect some recent articles to demonstrate a recent capacity auction, while positive for reliable generators, is unlikely to halt the impacts of the President's Clean Power Plan (CPP) and currently idled Production Tax Credit (PTC). Combined, the CPP and PTC spell trouble for existing nuclear generators. Exelon has many nuclear reactors, a number of which are in Illinois. The company recently released financial information which is communicated in Crain's "Exelon's case for how poorly its nukes are doing." In a bid to build more support for subsidies financed by rate payers, the state's largest power generator provided Crain's with its most detailed look at the financials of the company's six Illinois nuclear stations. Round-the-clock energy prices right now for 2016 and 2017 are a little over $30.50 per megawatt-hour. That's down from about $33 a year ago for those time frames. Capacity prices are on the rise thanks to auction changes PJM has engineered to increase them. ...The Chicago-based company learned on Aug. 21 that it will receive substantially higher revenue beginning in 2018 from increased consumer payments to power-plant owners for their promise to produce during high-demand periods. The capacity rule changes move from bids of "a promise" to bids of a firm commitment, specifically because of non-performance of capacity assets during the "polar vortex" periods early in 2014. When Crain's states capacity rules are engineered to increase capacity prices they mean they introduced penalties for non-performance and requirements for ensuring supply is reliable. An example of improving reliability is a new primarily natural gas-fired generating station that has cleared the capacity auction - the plant will "run on natural gas and ultra-low-sulfur distillate fuel oil as a back up." Duel fuelling recognizes the supply problems that can occur with delivery of natural gas, particularly in the rare harsh winter cold snaps when the fuel is also needed for heating. 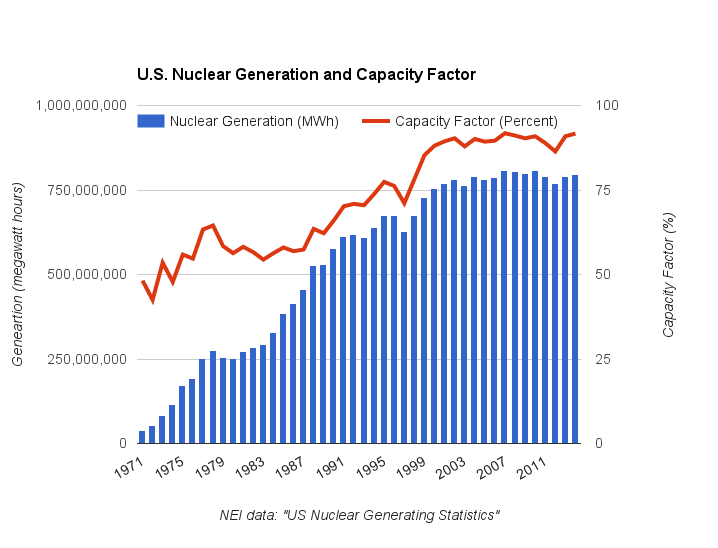 Firming up capacity rules is seen as a boon to nuclear because nuclear is perceived, for good reasons, as being a reliable generator. That is truer today than ever, despite it being many years since a new reactor achieved commercial operation. Improved performance is not, as best I can tell, unique to nuclear power. Natural gas-fired generators are far more efficient than decades ago, industrial wind turbines seem to be maintaining a higher performance level longer with better preventative maintenance, and coal-fired units emit less pollutants (aothough it's still significant). Operational excellence isn't always considered relevant. The Clean Power Plan has been advanced by the Environmental Protection Agency (EPA) under the Obama administration. I've been waiting for something sharable to be written on the final rules but am yet to see anything definitive to advance that what I wrote on the proposal last fall. Brad Plumer covered the finalized rules with the example of Indiana. It's a nice start to explain how the intensity figure is arrived at. 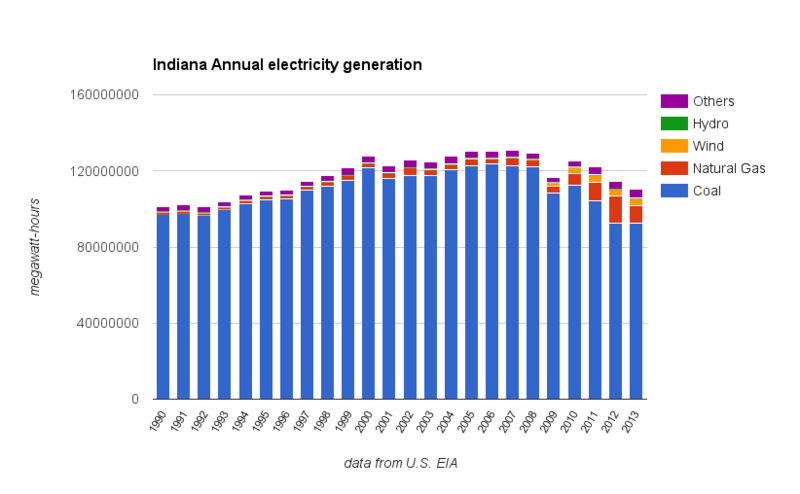 Indiana currently has a bunch of fossil-fuel plants — 88 percent are coal/steam, and 12 percent are natural gas combined cycle. In 2012, those plants emitted 2,021 lbs/MWh of CO2, on average. (0.88 * 1,305 lbs/MWh) + (0.12 * 771 lbs/MWh) = 1,242 pounds of CO2/MWh. And that's it. That's Indiana's goal. The state has to get its power plants' emissions down from an average of 2,021 lbs/MWh in 2012 to 1,242 lbs/MWh in 2030. The Indiana example sidesteps the challenge of existing nuclear units - which are ignored in the rule (as are existing wind turbines and solar panels). 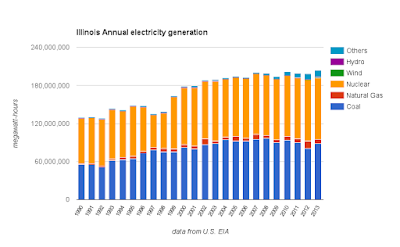 Illinois proportion of coal to gas generation is very similar to Indiana's, but half of Illinois' generation comes from nuclear-in which it leads the country. 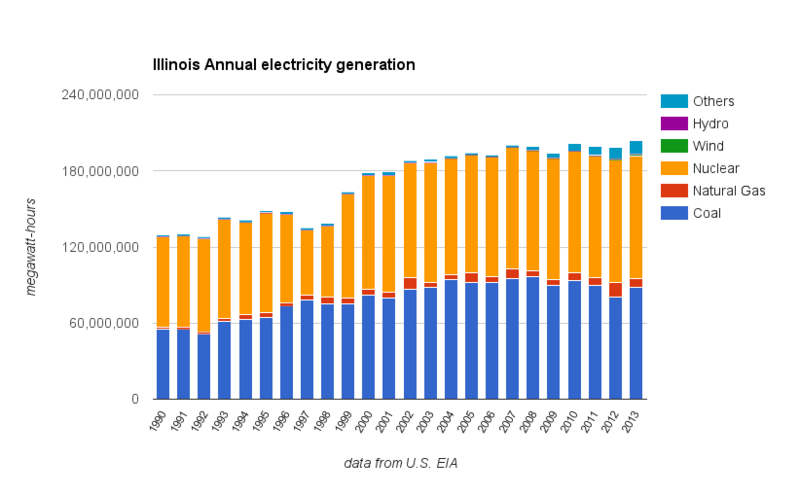 My specific question is: if Illinois nuclear units are replaced by combined cycle natural gas generators, would Illinois be rewarded under the Clean Power Plan? At the margins, this could create odd incentives. Say a state's power sector was faced with the choice of a) spending $500 million to extend the life of an existing reactor for 20 years or b) closing the reactor and spending $1.5 billion to replace it with new renewables. The latter would be costlier. But under the Clean Power Plan's rate-based goals, the state would only get credit for reducing emissions if it did the latter, not the former. This scenario should concern more people than the standard nuclear advocates. The U.S. Department of Energy noted in summarizing it's 2014 Wind Technologies report that Power Purchase Agreements (PPA) had " fallen to around 2.35 cents per kWh in 2014." That's $23.50/ MWh - beneath the $33-$34 of Exelon's best nuclear sites. ... wind PPA prices are reduced by virtue of federal and, in some cases, state tax and financial incentives. Furthermore, these prices do not fully reflect integration, resource adequacy, or transmission costs. So the cost of wind is greater than contracted, but much of it is paid by taxpayers. A main tool incenting industrial wind has been the Production Tax Credit (PTC). The PTC is currently not active, but the Obama administration, and democratic front runner for 2016 Hillary Clinton, want it reactivated . At more than $23/MWh (for 10 years), the PTC contributes to lowering the cost of wind supplied from the windiest locations in the mid west below low-cost Illinois nuclear pricing. The PTC is not needed to encourage the choice of wind over other new generation options - the PTC is needed to displace existing generators. Because wind has little capacity credit, or capacity value, it needs to be teamed with dispatchable sources - which in dreams are reservoir hydro and batteries, but are more likely to be gas, oil, and coal. That drives the need for capacity auctions, such as the PJM market has held, to secure resources that can be relied upon. It is being reported today that a number of Exelon's Illinois units had bids clear the PJM auction, but the vulnerable Quad Cities did not. I would be unsurprised by announcements that both Quad Cities and Clinton were closing in Illinois - joining New Jersey's Oyster Creek on the list already containing Vermont Yankee closing and Wisconsin's Kewaunee. In New York (outside of capacity auctions and government by anti-nuclear son of Cuomo), Ginna will likely end generation before Oyster Creek and Fitzpatrick may follow soon after. For the first time, we are seeing private equity speculate in new combined cycle gas turbines. These are large turbines that operate as base load supply (i.e., operate 24/7). They are locating those turbines near cheap sources of Marcellus and Utica shale gas, which are currently landlocked and less costly than hub prices. As such, some gas suppliers are willing to accept long-term contracts with new power producers. 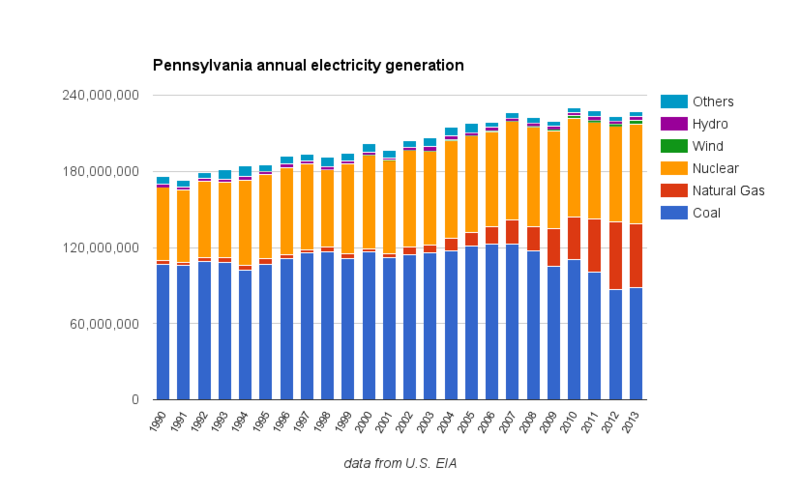 In Pennsylvania, as Illinois, it appears the Clean Power Plan would reward replacing nuclear generation with natural gas-fired generation. The new Clean Power Plan is being cited as promising 32% reductions in emissions, but that is almost certainly nonsense as the estimate is based on few nuclear units being retired -while incenting the retirement of nuclear units. An article at third way, When Nuclear Ends: How Nuclear Retirements Might Undermine Clean Power Plan Progress, looked at what actual emissions reductions were likely to be. The article is largely on modelling of three scenarios for the nuclear in the U.S. energy future: reactors operating for 60 years, for 40 years, and all being phased out 2025 (except 5 now being constructed). Under either the early retirement or phase-out scenario, U.S. emissions would go up dramatically, even under compliance with the existing renewable portfolio standards (which could be more ambitious). Emissions increases due to nuclear retirements would sabotage the carbon reductions targeted by the EPA’s Clean Power Plan and, in the worst case, could wipe out a decade’s worth of progress by effectively returning U.S. electricity sector emissions to 2005 levels. Not only is the Clean Power Plan unlikely to deliver emissions reduction anywhere near the extent it claims, the coming closures of nuclear generators make it increasingly unlikely the country will meet its Copenhagen pledge to reduce greenhouse gas emissions to 17% below 2005 levels by 2020. 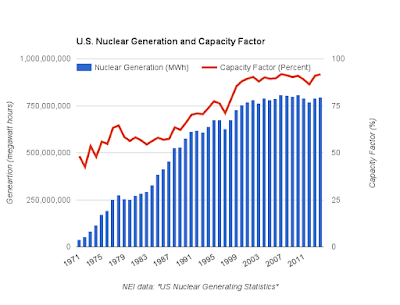 Jim Hopf wrote a 2-part cotnribution on the American Nuclear Society's Nuclear Cafe site. Many within the industry are pleased with the CPP. That, despite the fact that the CPP does little to nothing to keep existing plants open and that, overall, US policies do not treat nuclear anywhere near the same as renewables, as an emissions reduction option. It’s likely that they thought that the CPP is the best they’re going to get. This is a reflection of just how little political influence nuclear has relative to pro-renewable and pro-fossil interests.